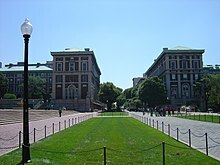 Columbia University (officially Columbia University in the City of New York) is a private, Ivy League, research university in Upper Manhattan, New York City. It was established in 1754 as King's College by royal charter of George II of Great Britain. Columbia is the oldest college in New York State and the fifth chartered institution of higher learning in the country, making it one of nine colonial colleges founded before the Declaration of Independence. After the revolutionary war, King's College briefly became a state entity, and was renamed Columbia College in 1784. 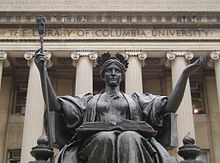 A 1787 charter placed the institution under a private board of trustees before it was renamed Columbia University in 1896 when the campus was moved from Madison Avenue to its current location in Morningside Heights occupying land of 32 acres (13 ha). 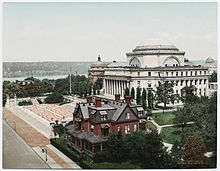 Columbia is one of the fourteen founding members of the Association of American Universities, and was the first school in the United States to grant the M.D. degree. 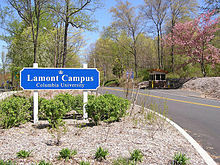 The university is organized into twenty schools, including Columbia College, the School of Engineering and Applied Science, and the School of General Studies. The university also has global research outposts in Amman, Beijing, Istanbul, Paris, Mumbai, Rio de Janeiro, Santiago, AsunciÃ³n and Nairobi. 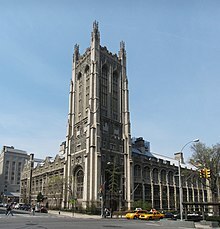 It has affiliations with several other institutions nearby, including Teachers College, Barnard College, and Union Theological Seminary, with joint undergraduate programs available through the Jewish Theological Seminary of America, Sciences Po Paris, and the Juilliard School. Columbia annually administers the Pulitzer Prize. Notable alumni and former students (including those from King's College) include five Founding Fathers of the United States; nine Justices of the United States Supreme Court; 20 living billionaires; 29 Academy Award winners; and 29 heads of state, including three United States Presidents. Additionally, some 100 Nobel laureates have been affiliated with Columbia as students, faculty, or staff, second in the world only to Harvard. Discussions regarding the founding of a college in the Province of New York began as early as 1704, at which time Colonel Lewis Morris wrote to the Society for the Propagation of the Gospel in Foreign Parts, the missionary arm of the Church of England, persuading the society that New York City was an ideal community in which to establish a college; however, not until the founding of Princeton University across the Hudson River in New Jersey did the City of New York seriously consider founding a college. In 1746 an act was passed by the general assembly of New York to raise funds for the foundation of a new college. In 1751, the assembly appointed a commission of ten New York residents, seven of whom were members of the Church of England, to direct the funds accrued by the state lottery towards the foundation of a college. Classes were initially held in July 1754 and were presided over by the college's first president, Dr. Samuel Johnson. Dr. Johnson was the only instructor of the college's first class, which consisted of a mere eight students. Instruction was held in a new schoolhouse adjoining Trinity Church, located on what is now lower Broadway in Manhattan. The college was officially founded on October 31, 1754, as King's College by royal charter of King George II, making it the oldest institution of higher learning in the state of New York and the fifth oldest in the United States. 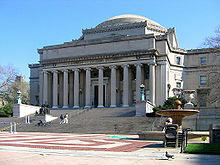 What are the academic rankings for Columbia University in the City of New York? 1. number 7 for Academics. 2. number 42 for ROI (Return on Investment). 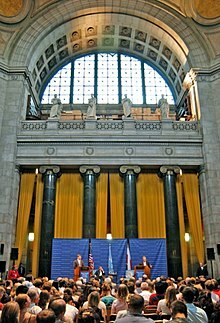 What universities are similar to Columbia University in the City of New York?